One of our goals with Tableau Public was to create a free, easy-to-use tool and empower people to create their own data visualizations. Naturally then, we were excited to take part in the International Open Data Hackathon over the weekend. Some of us went to represent Tableau and work with other Seattleites in crafting exciting products using data. 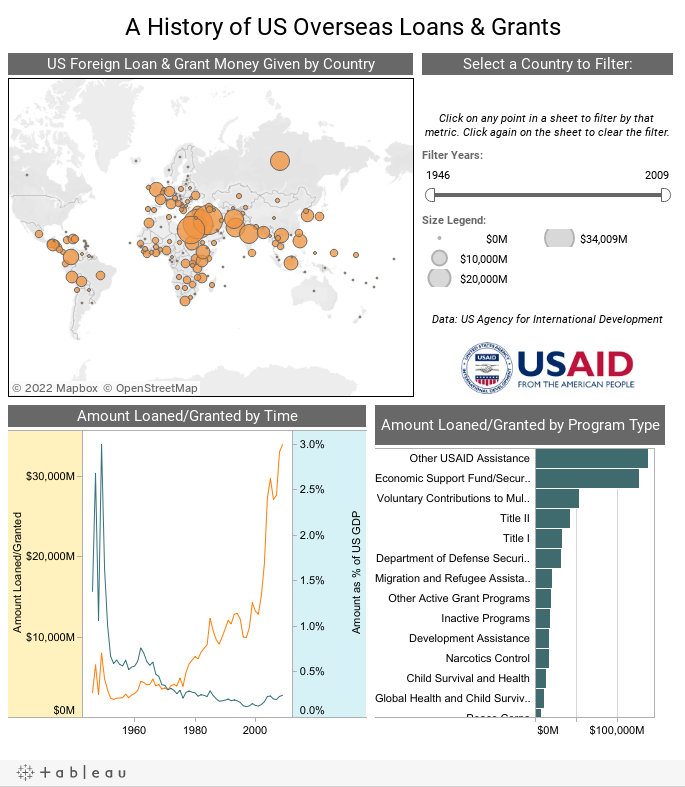 Here's one viz we made about the history of US Foreign Aid. A few interesting nuggets in this visualization. Overall amount spent on foreign aid has risen substantially since 1946. Total amount as a percentage of total GDP, however, has drastically fallen. This is true for most categories, with one notable, and unsurprising exception being the "nonproliferation, anti-terrorism" category. As expected, Afghanistan receives the most money in that category. But did you know that North Korea is right on its heels? Click on any point in a sheet to filter the other sheets by the same metric. You can also use the year filter to change the time period for the whole dashboard. What observations do you make about US Foreign Aid?